Flowcharts, how do I love thee? I haven’t used flowcharts much in my teaching or research, but this may change soon. 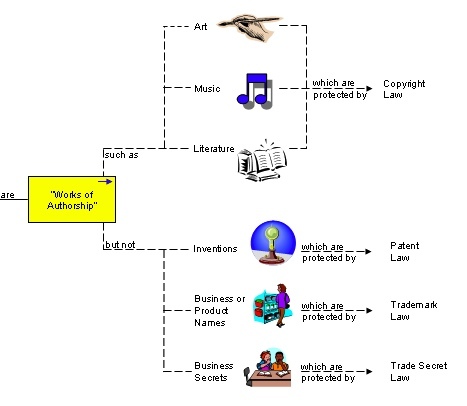 First, there is this marvelous mashup of flowcharts with web pages to teach copyright law. Biologists have long used keys to simplify identifying critters, but I can easily imagine using flowcharts to teach, for example, the experimental results that would allow you to identify different kinds of population regulation. Perhaps the real utility of flowcharts for graduate students may lie in the underused but powerful practice of Strong Inference. SI endorses building a logic tree when planning your research so that each experiment tests as many different hypotheses as possible. The end result is that each experiment produced maximum bang for your research buck. I am seeing more and more flowcharts in the NSF grants I review. How would you flowchart your dissertation research? 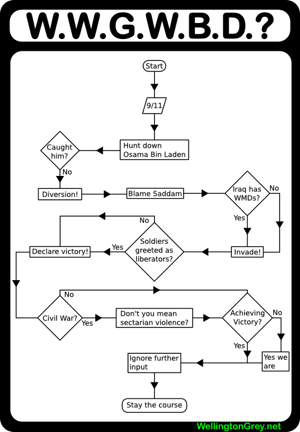 Finally, flowcharts are effective ways of detecting patterns in otherwise seemingly inscrutable behavior. This entry was posted on Sunday, February 25th, 2007 at 9:13 am and is filed under Design, Grad School, Research, Science, Teaching, Visual Explanations. You can follow any responses to this entry through the RSS 2.0 feed. You can leave a response, or trackback from your own site. 2 Responses to Flowcharts, how do I love thee? I think You should check the mind manager pro which offers a much nicer look of the charts and a very clever way of making them. I use since a month and now I catch myself on writing everything in there. I also tested Personal Brain by thebrain.com which is also great. All the mind maps offer charts which is very usefull.